The following is a guest post about taxes. If interested in submitting a guest post please read my guest post policy and then contact me. Taxes are so complicated. Doing taxes is just about the scariest thing ever. To make your life a little simpler, here is a post that will help you understand how you can be better prepared to do your taxes. It is important to be proactive while you are doing your taxes and diligent enough to do it correctly.Taxes are so complicated, right? I mean, we’ve all been there. 15th April is right around the corner and we haven’t even lifted a finger when it comes to tax planning. And let’s just face the facts here. Doing taxes is just about the scariest thing ever! All those big scary words and all those numbers! It is so hard to deal with! Or is it? Well, I’ll let you in on a little secret that I carry around with me wherever I go. I did my taxes! And yes, way before the dreadful date too! And it was quite a breeze. No, no, my friends, you are mistaken. I am no rocket scientist, but I do come close, don’t I? All because I did my taxes! I’m going to break it down for you and let you in on my super power. It’s as simple as taking the smallest advice from your neighborhood income tax consultant. The number one reason why I’m sure most of you don’t prefer going to tax consultants is because you’re a little ashamed of what you think is an inadequacy. Let me tell you something. More than half the American population does not pay taxes and mostly because they don’t know how! So you’re not alone. I was one of those people too! Until, I researched about tax consultation. A lot of people are now taking the help of professionals to get things done. To help you with your book keeping, you’ve got experts like Pershing Yoakley & Associates, and Suby, Von Haden & Associates who can help you with your finances. But you know what the best part about the age of the internet is? You can now do it online. You’ve got websites like 1800accountant.com who can provide you with personal finance advice online! It has become that simple. And a lot less embarrassing too! Did you ever think about all the tax benefits you can avail? Let that be motivation enough for you to get in touch with an income tax consultant. You probably don’t know that there are some government schemes that you can avail that will give you some respite from income tax liabilities. Let me give you the example that my tax consultant gave me. ObamaCare. Under ObamaCare, a certain income bracket can avail certain income tax benefits. It’s important that you sit down with your consultant and chart out a strategy so you don’t have to fret at the last minute. Before the tax season hits, you might want to go in for some employer-sponsored plans that may give you tax benefits. Did you know that dabbling a little in charity will save you on some taxes? Since donations reduce your taxable income, they also reduce your taxes. I feel like such a scientist for figuring that one out! But this is just the start of it. Sit down with your consultant now and figure out how to save on your taxes. So you’re a small business owner who hates doing his taxes. Doing taxes for small business is a much more complicated affair than individual tax preparation. You need to adjust your prices according to income tax liabilities. Not just that, you have to take care of all bills and receipts that count as reimbursable expenses. It’s not easy, and especially not easy if you’re at it alone. Don’t lose out and hire a professional who is adept at small business tax consultation like 1800accountant.com. You will be much more satisfied and your business will boom! By hiring a professional, there is a reduced margin of error. You’ll save on time and income tax liabilities. Don’t let the price of a professional drive you away from making a good decision. It’s an investment after all! And trust me, once you get some help and are able to file your taxes correctly and on time, you too will feel like a total rocket scientist! Author Bio: Jordan is a 28 year old entrepreneur and a former Business Developer. With an insatiable appetite for the good life, keeps himself current on topics related to technology, gaming and his first love, food. He shares his views in his blog posts hoping to provide valuable information to entrepreneurs like himself who wish to establish a successful business. 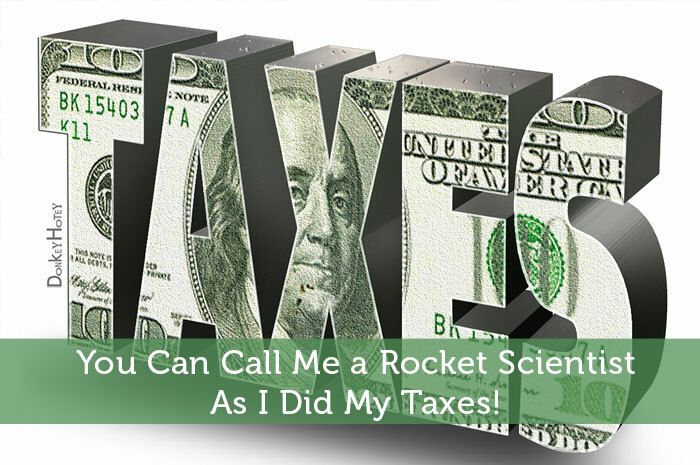 You Can Call Me a Rocket Scientist, As I Did My Taxes! My husband is an accountant and a retired IRS agent. He audited multi-national billion $$ corporations but this year he really struggled with our taxes due to some property I acquired from my mother. We sold some and between the rental income and expenses, the depreciation we had to recapture and other investments we had, it was a real nightmare. Just figuring this year’s estimated taxes was a headache in itself. Our belief is that the government deliberately makes the regulations so complex that no one can comply and then they have to pay a penalty….more money for the government! BTW, my son truly is a rocket scientist in the field of jet engine propulsion!! I’m very grateful that my father is a tax professional. It saves me a lot of headaches come April. Thankfully our financial situation is rather dull and our taxes are pretty straightforward. We do it as soon as we can every year. But if we owned a business we would probably hire someone to do our taxes because its getting quite complex at that point. I used to do my own taxes, back when my tax situation was simple. But now that I am married with a small business and rental property, it’s just too time consuming for me. I pay a pro to handle them. While I would love to not have to pay my CPA, I’m OK with it. When you’re doing your own taxes, most people can get by with TurboTax, TaxCut, or even just the paper version. But as soon as things start getting complicated with your own business, rental property held in a corporation, or even some compensation plans with stock options, ESPP, and RSUs, things can get complicated quickly. The one upside is if your taxes are that complicated, hopefully you have enough miscellaneous deductions that your tax preparation fees paid to your CPA will be deductible also. Hopefully.